After returning from maternity leave, I surprised everyone –including myself – by changing careers and taking on a new role with the family business. Instead of having a five minute commute, I now drive 45-minutes each way. Faced with the reality of being in the car daily for ninety minutes, I am taking advantage of the time to do things I haven’t had time to do before, like listen to audio books, podcasts, and audio CDs of lectures delivered at church. I also started a new habit. After loading up my smartphone with the Rosary Army podcast, I committed to praying the rosary daily either on my way to work, or on the drive home. Using the RosaryCast MP3 to first lead and now guide me, I’ve learned some of the prayers I’m less familiar with, particularly Hail Holy Queen. I’m also learning the mysteries and trying to really reflect on them during the prayer. There are days when I pray the words cheerfully. There are days when it feels like a real chore. There are days when it feels routine and my mind wanders. There are days when I can barely choke out the words through my tears. There are days when the words are a very real and physical comfort to me. There are days when the rhythmic repetition soothes me. 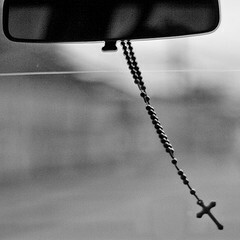 When I pray the Rosary, I imagine Mary riding with me in the front seat, someone to talk with during the drive. I tell her my thoughts, whatever weighs on my mind, particularly people I'm praying for. Sometimes I have specific requests, and other times I allow the Holy Spirit to inspire me. Someone I know expecting a baby, the victims of a tragic traffic accident that happened outside the office building last week, or just an unknown woman walking down the street with two young boys and a baby in her arms. I envision Mary taking these petitions up to our Christ Jesus, her being in His presence, just a Mother spending time with her son. This May, as we honor our mothers, make a point to pray with Mary for special intentions.